The Story: Ned Grossberg, the disgraced former head of Network 23, has resurfaced on the board of rival Network 66 just in time for the all-important tele-election. His scam–non-existent “ViewDoze” technology that allegedly allows people to watch an all-night “Porky’s Landing” marathon while they sleep–is artificially goosing the ratings in favor of Network 66’s candidate Harriet Garth. However, it’s only the opening gambit in a much larger scheme intended both to embarrass Network 23 and to stage a boardroom coup. Edison’s exposé of “ViewDoze” is sidelined when Ben Cheviot learns of “leaked” footage that purports to show Harriet Garth in an election-eve tryst. But the video has been faked…or has it? Behind the Screens: This was apparently the first episode of the second season to be filmed, which is perhaps why Grossberg feels the need to provide short bios of Edison, Theora, Cheviot, Murray and Max to the assembled board members. 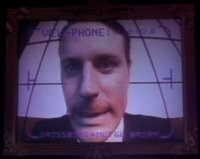 Strangely, Max Headroom barely makes an appearance in his own show, which may be one reason this was held back a couple of weeks. When Edison calls Theora in the middle of the night, he’s upset to see her sharing her bed with an unidentified male arm. He spends about half of the story pissed at her, even though he’s had ample opportunities to put the moves on her prior to this. In addition to the return of Charles Rocket as Grossberg, this episode introduces Andreas Katsulas as one of the Network 66 board members. Katsulas later went on to play recurring Romulan foe Commander Tomalak on Star Trek: The Next Generation and Narn diplomat G’Kar on Babylon 5. Truth to tell, the tele-election doesn’t quite make sense. The winner appears to be determined solely by whichever network is ahead in the ratings “auto-count” at the stroke of 9:00 am. That seems awfully early, or do people in the future start work at 10:00 am? On the other hand, if it’s a worldwide election, that suggests that a large portion of the global audience would’ve slept right through the Harriet Garth scandal. In the end, the plot is vaguely reminiscent of The Phantom Menace, in that everything our heroes do plays right into the villain’s rise to power. Grossberg unseats the head of Network 66 and becomes a recurring enemy during the short second season. There are at least two genocides happening on the other side of the world, and that’s not even counting the plague of frogs in Egypt. As before, the politics of the future are ill-defined. A line of dialogue suggests that the networks themselves aren’t the actual government. We never do learn what offices are being filled or what portions of the world they represent.